At last the Mackerel have finally turned up in numbers. Having seen numerous reports from friends, it looks like the Mackerel have finally made an appearance. The Mackerel turned up fairly early this year, with the first regular catches coming towards the end of March, then it all went very quiet for ages. Now they are back, pushing loads of White Bait on to the beach. Behind them the come the Bass, Rays, Tope and Dogfish, to name but a few; all feeding on the left overs. It is nice to see the Mackerel, but it is even nicer to see the number of Rays that have been caught over the past week. For some reason I struggle to catch Rays from the shore, but some people seem to have no problems catching big Rays. 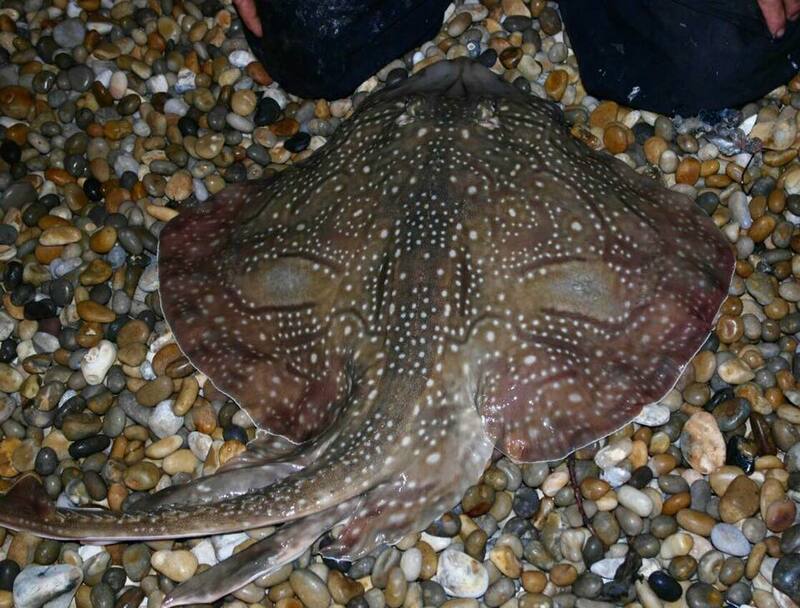 Steve Perry had this 7lb Thornback from Chesil. 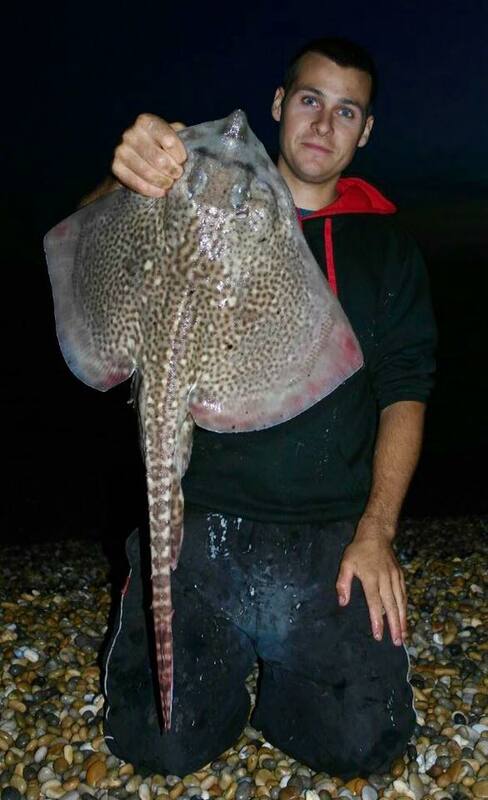 Not content with that he went on to catch a 12lb Undulate Ray. Chesil Beach forecast: It will be tough fishing on Chesil today (Tuesday) with a stiff SW wind straight in your face. Forget trying for distance, as you wont get any. With waves exceeding 2m at times a Mackerel head fished out at 10m will be the best option for a decent Bass. It is better to hold your rod in these conditions and keep the line tight. If it goes slack and you don’t take the slack up, you will get your tackle buried in the shingle. Take care not to get too near the water, as the undertow is very powerful and dangerous. The wind will settle down a bit from Tomorrow, but conditions will still be a bit tough. I would not recommend trying to fish Chesil for the next few days if you are a novice angler. You will just end up frustrated. Those that have a bit more experience should enjoy some Bream and Gurnard catches, and if you are lucky a decent Ray. Most of the Ray have fallen to Squid, Mackerel or Sandeel. Portland: Avoid the West side of the Island today, as it will be rough. However the East side will provide shelter and plenty of Wrasse. As long as the water stays clear, you will be able to target the Wrasse on lures as well as bait. Try Church Ope Cove at dusk over the next few days. The fishing can be superb with a lure rod, or a large float with a strip of Mackerel. Target species would be Bass, Pollock, Garfish and Mackerel. I have often picked up a Mullet on the mackerel strip. Portland Harbour: This should be a good mark, with plenty of places to shelter from the wind. There are a few Scad being caught, along with a number of Small Bass. Flounder and Mullet are around in numbers, with Sandsfoot and Castletown being good spots. Weymouth Bay: I have heard of several holiday makers having great sport in Bowleaze Cove and along Preston Beach. There seems to be plenty of Gurnard, Flounder and Dabs, as well as Red Mullet. A few Smoothound have been caught, but most of them seem to be under 4lb. 13 Responses to "Mackerel Mayhem"
I was at Hive Beach Saturday and the beach was covered with white bait under the cliffs. Great news about the mackerel. Does anyone know if they have appeared at west bay. They are all along the coast John. Hi Sean – We’ve spoken before and you were kind enough to give some advice. 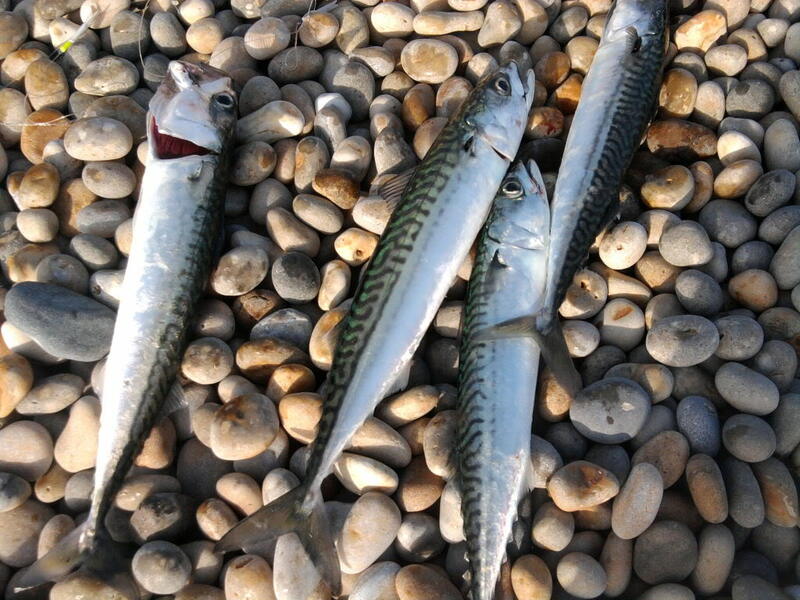 What’s best for Mackerel off of Chesil, thinking of spinning or feathers? Any advice welcome….and also where we should pitch up. SPinning and feathering both produce Mackerel. Spinning is more fun. At the moment the Mackerel are all along the beach, so it doesn’t matter where you go. Just turn up and start casting. You might have to wait half an hour or so, for a shoal to come through. Thank you Sean. Do you do any guiding around Lyme Regis/ West Bay area. john. Yes I guide as far West as Seaton. Drop me an email if you want my price list. What are you trying to catch Paul? Both Bass and Mullet come into the surf once the shoals have moved on. Mullet can be caught on small strips of Mackerel, or if there is any washed up Whitebait on the beach, use that. Bass will take a Mackerel head, or a lure. Other species such as Gurnard, Red Mullet and even large Rays will also come in to feast on an easy meal. THey are just not as easy to see. They could also be shad you’ve seen. A friend and I caught 3 last week, one on float fished whitebait, and 2 on a small spinner. I believe a rare catch and as a protected species of course all went back. They were in amongst the bait shoals close in. At first we thought they were bass, until we caught one..! They are a delicate fish and need to back in the water quickly with minimal handling. Good to see them, hopefully making a come back..
Shad never crossed my mind to be honest Moo. I have only caught one, and that was on a lure on Chesil a couple of years ago. Good to know that there are a few around.